On today’s episode of Crushing Comics I unveiled the first international comics haul of new comics collected editions that’s arrived since I’ve been here in New Zealand! I don’t know how I made it this long without a fresh supply of books (and hopefully not any spiders). Captain America (1968) Omnibus, Vol. 3 is the #49 Most-Wanted Marvel Omnibus of 2017 on Tigereyes’s Secret Ballot. See the Captain America Guide for more details on how to collect this run. Visit the Marvel Masterworks Message Board to view the original posting of results by Tigereyes. What Is It? 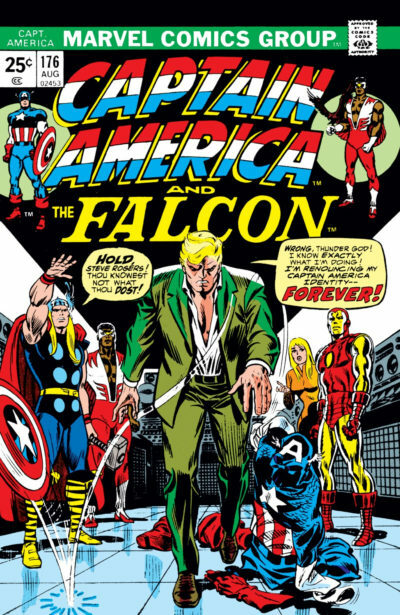 Captain America’s early-70s stories adventures in Captain America (1968) were shared with his partner Falcon and featured a backdrop of Steve Rogers butting heads with SHIELD and losing faith in the government he represents. However, the real reason to read this run is Sal Buscema’s artwork! This run begins in May 1972 and ends in December 1975. Past Ranking: This year is the book’s debut placement in the ballot results. I’m puzzled over how this edition got shut out of the 2016 survey when it’s one of the most obvious gaps in all of omnibus land! Creators: Primarily written by Gerry Conway and Steve Englehart with pencils by Sal Buscema and inks by Vince Colletta. Probable Contents: Collects Captain America (1968) #149-192 and material from Foom (1973) #8. This is a perfect fit between two existing books – Captain America Volume 2 ends with Captain America (1969) #148 and Cap by Kirby picks up at #193. Can you read it right now? Yes! This hypothetical omnibus covers Captain America Masterworks Volume 7, Volume 8, Volume 9 – the latter of which was released just last month.See the Captain America Guide for other collecting options. Also, this entire run is covered by Marvel Unlimited! After this post, you should have more than enough ammo to fill out your 2017 Most Wanted Marvel Omnibus Secret Ballot, which is due by Sunday at midnight! I’ve suggested over a hundred possible votes! What exactly is “The Masterworks Era,” aside from something I just made up? It refers to the period of comcis that Marvel has covered with their deluxe, standard-size hardcover Marvel Masterworks reprint line. The Silver Age portion of the line begins with Fantastic Four #1 in 1961. The end is a little fuzzier. The Silver Age is understood to end in 1970-71, but with a handful of exceptions Marvel has already pushed past that point with every line of Masterworks collections. In fact, their newest two Masterworks lines are The Spectacular Spider-Man (1976), Spider-Woman (1978), and The Savage She-Hulk (1980)! Yes, that’s right – Masterworks now cover comics that began in the 1980s! That’s like when the oldies station of my youth started playing Madonna songs. Plus, the farthest outlier, Uncanny X-Men, has reached all the way up to issue #188 in 1984. 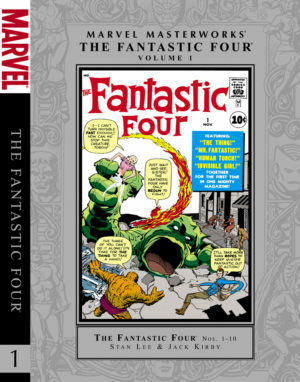 When it comes to classic Omnibuses, until this year Marvel followed a specific formula almost every time – one omnibus contained three Masterworks volumes. We’re now seeing them deviate from that formula with Amazing Spider-Man, Daredevil, and Thor, all of which contained more than the customary three volumes. To figure out what comics are due for potential omnibuses to feature in this post, I had to first figure out both what has been covered by Masterworks volumes and what has been skipped! That’s not really a part of this discussion, but if you’re interested, I’ve shown my work. Red Wolf (1972) – This has never been reprinted in color, but does not have enough material for an omnibus. Ghost Rider (1973) – This has never been reprinted in color and is listed below! Son of Satan (1975) – This received a TPB collection in 2016 and is too short to be an omnibus on its own. Spider-Woman (1978) – This has begun to be Masterworked and could be an omnibus, but we need more MMW volumes first. Chamber of Chills (1972) – A horror anthology; this has never been reprinted fully in color. Doctor Who – This is licensed material. Supernatural Thrillers (1972), a horror anthology; this has never been reprinted fully in color. Vampire Tales (1973) – An anthology series featuring Blade and Morbius. This has been collected in TPB and could be Masterworked, but it’s too short to be an omnibus without including other material. Master of Kung Fu (1974) and The Deadly Hands of Kung Fu (1974) – Collected in Omnibus but not Masterworked. Man-Thing (1974 / 1979) – Collected in both an omnibus and a Complete Collection line, but not Masterworked. The Invaders (1975) – Collected in a pair of Complete Collections, and previously in Classics; could still be Omnibused – listed below. Super-Villain Team-Up (1975) – Collected in a single Complete Collection; too short for omnibus, but could appear in a Namor omnibus line. Captain Britain (1976) – Collected entirely in a pair of OHCs; could still be Masterworked, but an omnibus would be redundant since there’s nothing left to add. Nova (1976) – Collected completely in a paperback Classic line, but not omnibus or Masterworks – so it’s covered below! What If? (1977) – Collected in a paperback Classics line, but not in omnibus – so it’s covered below! Devil Dinosaur (1978) – Previously collected in omnibus, and recently in paperback; could be Masterworked! Machine Man (1978) – Collected in a single TPB in 2016 and has previously appeared on the survey; however, without the rights to reprint 2001: A Space Odyssey material Marvel likely can’t expand this to an omnibus. This list omits Western titles like Tex Dawson, Gunslinger (1973), Gun-Slinger (1973), and Gunhawks (1972) and licensed material Marvel can’t Masterwork, including Conan, Doc Savage, Godzilla, The Human Fly, John Carter, Kull, Micronauts, Planet of the Apes, Red Sonja (in her own title and in Marvel Feature (1975), Shogun Warriors, Star Trek, Tarzan, 2001: A Space Odyssey, and The Wizard of Oz (based on the film). How am I defining “due” here? It’s any superhero universe series that the Masterworks line has skipped entirely or any Masterworks line with three or more un-omnibused volumes. Any comic with a Masterworks line that’s in-progress with only one or two volumes is not included: Ka-Zar, Luke Cage, Marvel Team-Up, Marvel Two-in-One, Not Brand Echh Vol. 1, Rarities Vol. 1, Rawhide Kid, She-Hulk, Spectacular Spider-Man, Spider-Woman. I also didn’t include the one-and-done Masterworks volumes Champions and Deathlok as potential omnibuses, since the omnibus would be the same as the Masterworks! It’s the penultimate stop in our trip backwards through time to find all of the Marvel runs most in need of Omnibus treatment. Why? For fun. For accumulating rainy-day reading. And, to fuel our 2017 Most Wanted Marvel Omnibus Secret Ballot votes! Marvel in the 1980s is really a tale of two different Marvels. The first half of the decade featured many continuing 70s series, a handful of limited series, and relatively few new ongoing titles – most of which were direct spinoffs of characters from other books. However, after Secret Wars II in 1986 the line got a serious shake-up, with many titles outside of what I think of as “The Big 9” and their satellite books getting cancelled or rebooted, plus tons of new ongoing and limited series and a whole new line of comics with New Universe!